Last week I went to one of my favorite haunts...DSW...a discount shoe store with a ton of shoes to choose from and came home with a very simple pair of brown leather flats for less than 19.00 with my $10 off coupon. I just love it when that happens. I have always been a shoe addict but I developed RA about 8 or 9 years ago and could no longer where any of the shoes (mostly heels) in my wardrobe. I gave away a ton of treasured shoes that I had for a long time and I can tell you it was very painful. My addiction didn't go away...I still love to buy shoes just different kinds of shoes now. Mostly sandals, casual flats, soft leathers and very, very low heels for that once in six months that I put a dress on. When I eyed this particular pair of shoes, made by Blowfish, I saw possibilities of doing something fun with them. They originally had a wide elastic band going across the arch which I immediately cut off when I got them home and proceeded to pull from my stash some fun things to make plain into jazzy and fun. On Friday when I was celebrating my friend Lisa's birthday, we stopped at a fabulous antique button store. 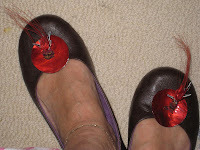 I purchased several pairs of fabulous buttons specifically intended for these shoes. 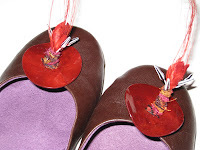 I settled on the big red shell buttons and added antique flowers, embellishments and fiber atop the buttons, poked 2 holes into the leather and sewed the button creation adorning my new brown flats.